Ah…mini pizza rolls and pizza pockets were one of our favorite afterschool snacks. They bring back childhood memories of coming home from school, settling down to relax/play and then snacking on them before tackling homework. Sure, the store-bought brands made it more convenient and quick for our moms to feed us hungry school kids. But homemade ones are just as easy to prepare ahead of time together as a family. Pizza pockets can be stuffed with favorite fillings that are not available from boxed brands, stored frozen and reheated in the oven whenever anyone wants a little something savory to eat. For National Cheese Pizza Day, we stuffed our snacks with plain shredded pizza cheese and waxed nostalgic about our childhood and the memories with our moms (dads and siblings) with whom we partook pizza pockets! Unroll chilled pizza dough. Cut into 4×4” inch squares (we re-rolled the scrap to make five total squares). Spread a little pizza sauce on each square, leaving about half an inch to the edge. Generously pile on the cheese (it will look bulky but melts down). Fold over and seal tightly with the tines of a fork. Place on a sheet of waxed paper misted with cooking spray (or use parchment paper). Beat the egg with water and brush on the tops of the pizza pockets. Bake in a preheated oven at 425 degrees F for 15 minutes. Remove from the oven and serve hot. Be careful when biting into the pizza pockets as the hot cheese might ooze out and cause a burn. Search our blog for other pizza recipes. We met a Brazilian bridesmaid when Islander was also in the entourage of a mutual friend’s wedding. Fabiana H. is married to an American and we enjoyed exchanging stories about our intermarriages. Inevitably, our conversation also led to Brazilian culture and, of course, cuisine! Since meeting her, we have treated ourselves to Brazilian steakhouses for special occasions, like birthdays. The servers, who look so fashionable in their gaucho pants, come around to each table and slice various fire-roasted meats from their skewers onto our plates. It is quite a carnivorous experience, balanced by a salad buffet and appetizers, including pão de queijo, a bite-sized, puffy cheese bread made especially with tapioca flour/starch. It is slightly crisp on the outside and chewy and hollow on the inside, like an addictive popover, and is best eaten hot and fresh from the oven. For our blog recipe post, we feature pão de queijo on Sete de Setembro (7th of September), the date that commemorates Brazil’s independence from Portugal in 1822. Sift the salt with the tapioca flour/starch and put in a mixing bowl. In a small saucepan, simmer the milk and oil, stirring to combine well. Pour into the tapioca flour/starch and blend until a smooth but sticky dough forms. Allow to cool for 10 minutes. Add the beaten eggs slowly into the dough and continue to blend until incorporated. Stir in the cheeses. 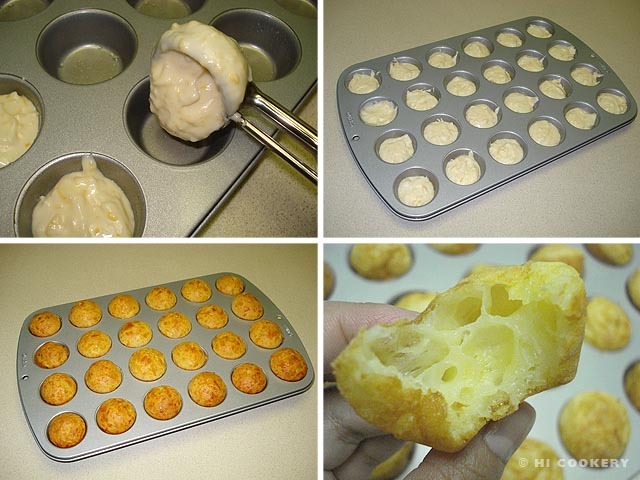 Scoop the batter three-quarters full into greased mini muffin tins. 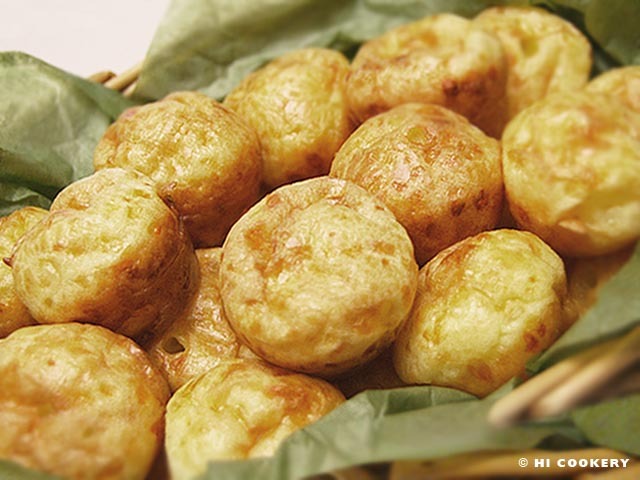 Bake in a preheated oven at 400 degrees for 20-25 minutes or until the bread puffs up and turns golden. Yield: About 3 dozen. The Portuguese spelling for Brazil is Brasil. 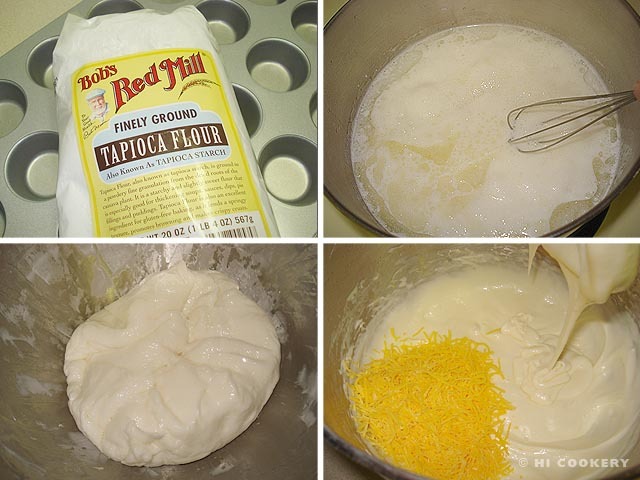 Gluten-free tapioca flour/starch can be found in the specialty-baking aisle of larger supermarkets, at Whole Foods or in international grocery stores. See our blog recipe post for caipirinha, Brazil’s national cocktail, on June 12, National Cachaça Day. Cheese gets sophisticated as a soufflé on its own national food holiday. Highlander, who would often make omelets with cheese for breakfast or brunch, feels special when Islander prepares this light and airy dish as an alternative. 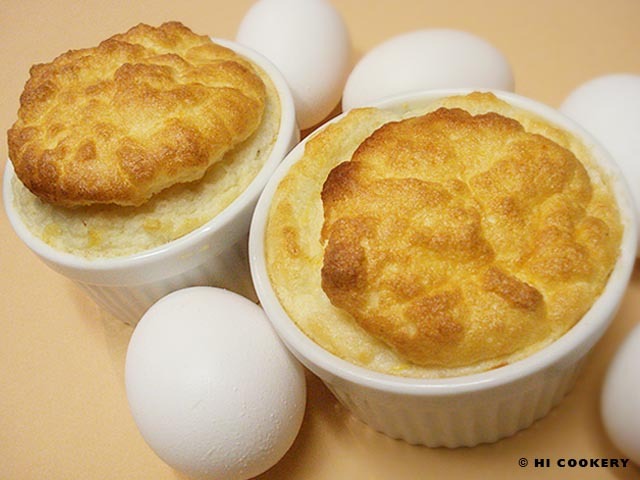 Going the “eggs-tra” mile in making this soufflé may sound cheesy but it is a nice change and a challenge. 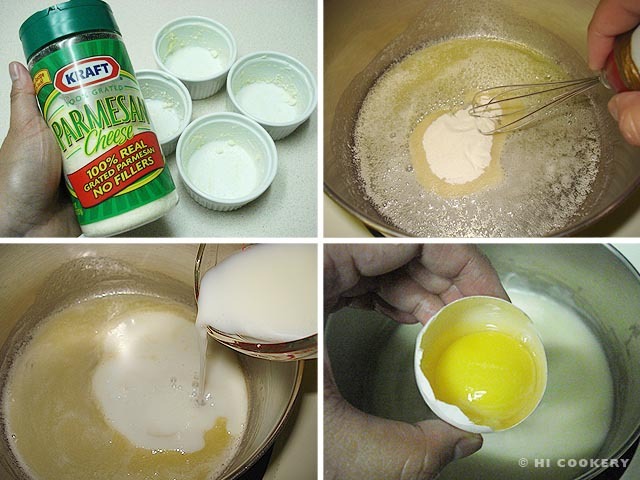 Grease the bottom and sides of four mini ramekins with 1 tablespoon of butter. Sprinkle Parmesan cheese over the butter. In a small saucepan, melt 2 tablespoons of butter on low heat. Mix in the flour until smooth and creamy. Pour in the milk and stir until slightly thickened. Add the salt and paprika. Remove from heat and whisk the egg yolks into the mixture. Beat the egg whites with a pinch of cream of tartar until firm. Fold a little of the meringue into the egg mixture. Add half of the cheddar cheese. Fold in the rest of the meringue and cheese. Mix gently until well incorporated. Fill each ramekin to the top. Place the ramekins on a baking sheet. Bake in a preheated oven at 375 degrees F for 15 minutes. The soufflés should rise and the tops will turn golden brown. Remove from the oven and serve immediately. The original recipe yields one big serving, so we shared the cheese soufflé. 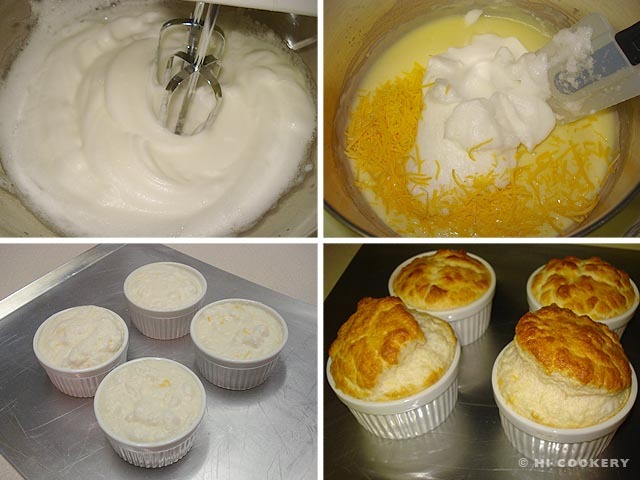 We doubled this recipe for our blog and were able to fill four mini ramekins. The soufflé will rise but fall within a few minutes out of the oven. The deflated dish still tastes great. There are days when we are too busy/tired/lazy to cook or too cheap/indecisive/moody to eat out anywhere. That’s when Highlander resorts to making one of his favorite comfort foods—a grilled cheese sandwich—because of the simplicity of the ingredients (bread, cheese and butter or margarine) and the ease of cooking. Adding luncheon meats, savory spreads and vegetable fillings; using artisan breads and imported cheeses; and slicing off the crusts or making special shapes with cookie cutters on the sandwich can enhance this basic recipe. But Highlander is content with the classic, especially for today’s blog post in observance of National Grilled Cheese Month and National Grilled Cheese Sandwich Day. 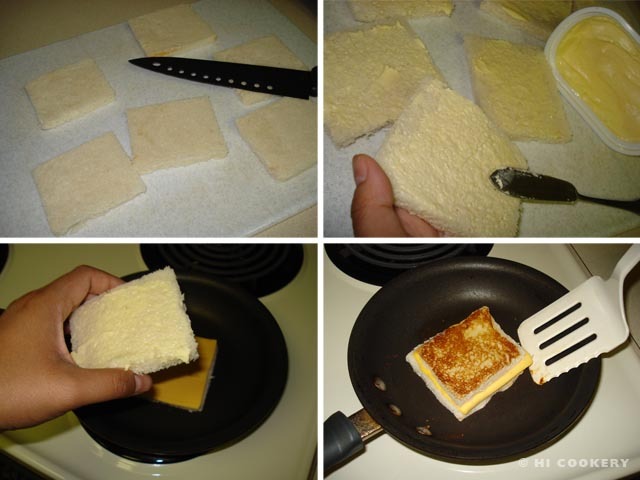 Below are two different methods (none of them using an actual “grill”) that we typically follow to prepare a grilled cheese sandwich. 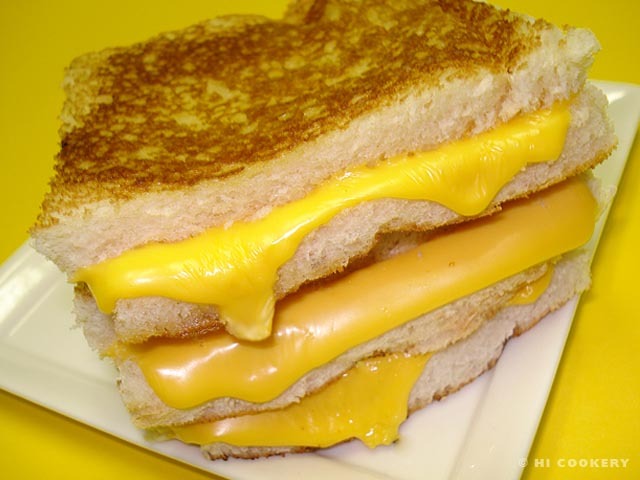 The first example was made with wheat bread and Swiss cheese and the second was made with white bread and American cheese. 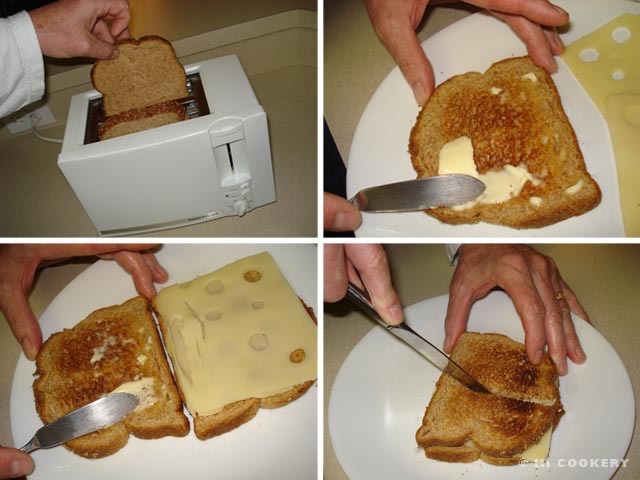 Toaster method: Toast both slices of bread. While still hot, butter one side of each bread slice. Put the cheese in between the bread slices. If necessary, microwave for a few seconds until the cheese is melted. 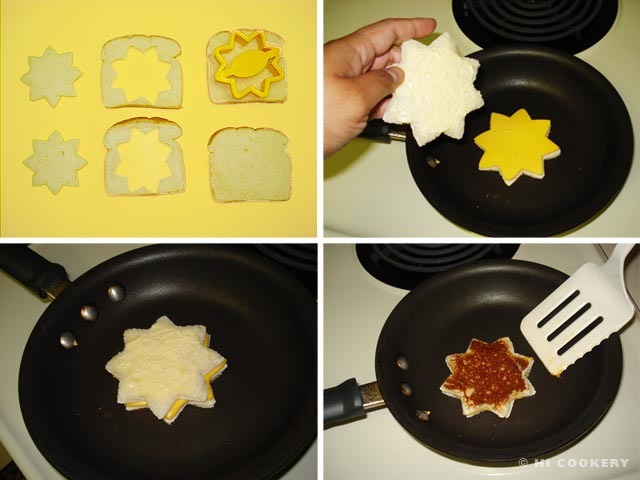 Stove top method: Butter both slices of bread on one side each. Preheat a pan on the stove top to medium high heat. Place one slice of bread in the pan with the buttered side down. Put the cheese on top of the bread. Then place the other slice of bread on top of the cheese with the buttered side up. Cook until the bottom bread slice is browned, then flip the sandwich over and repeat.